I got an amazing text from Elizabeth a couple weeks ago. 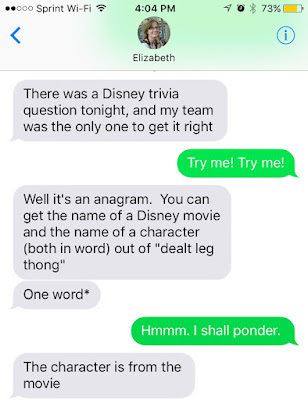 In case you can't see the image, here's the gist: Elizabeth's trivia team was the only one to correctly answer a Disney-themed bonus round answer. It was an anagram that contained the name of the Disney movie AND the name of a character in that movie. Obviously I immediately demanded that she tell me the clue, just as I'm sure you, too, are screaming that at your screen. Far be it for me to deny you. Behold! No pressure, but Elizabeth said I got it even faster than she did. And that, children, is yet another example of how encyclopedic Disney knowledge can win the day.